There’s something satisfying about hosting the Thanksgiving Day feast at your house. But how can you keep your kids (and visiting guests) entertained (and occupied) so that you can focus on meal prep, serving and hosting without the added stress? We’ve put together an ultimate toy and game list specific to keeping kids entertained on Thanksgiving so you can focus on the holiday, and not the “We’re bored” complaints. You may also want to consider if there are small pieces that could be a slipping or tripping hazard as you’ll be carrying dishes across the room during gameplay. Card games like go fish, old maid, crazy eights, and war are fun, fast and easy for all ages. Providing a list of instructions by the decks will help to ensure they can play while you are hard at work. Charades is perfect for a small or large group of players and you can even add in some Thanksgiving themed ideas of your own. Breaking the kids into evenly matched teams can make word games such as crossword puzzles, Mad Libs, and hangman more fun and help to build teamwork skills. Trivia games are a perfect way to pass the time and nothing is more classic than trivial pursuit which comes in multiple versions, included a 2000s version. Utter Nonsense (family edition) is geared toward large groups who love to have a laughter filled good time while showcasing your best (or worst) accents. 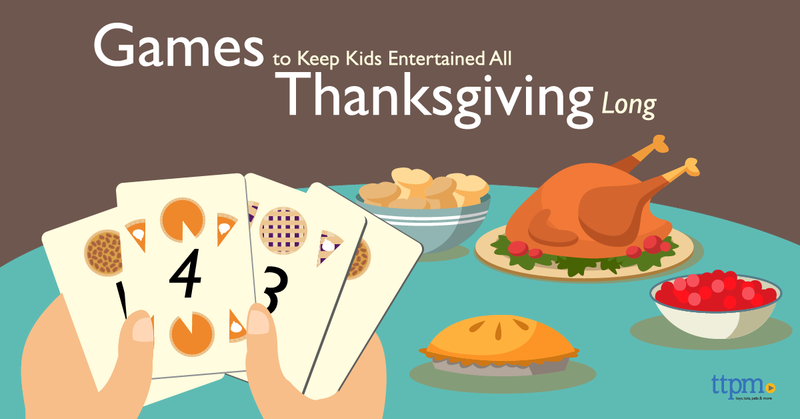 Keeping you, your guests, and the kids happy and having fun during Thanksgiving may seem like a challenge, but that’s why there are fun game options for all ages. If you didn’t see one above, search through our toy reviews for even more options (including adult party games for after the kids go to bed). The important thing to remember when picking Thanksgiving games to keep your kids entertained is that they should be all inclusive, playable for multiple people and provide at least an hour of fun for each. Now the kids can keep playing while the adults have dinner and celebrate.